First four Rivers of London Comic Series Boxset out soon! 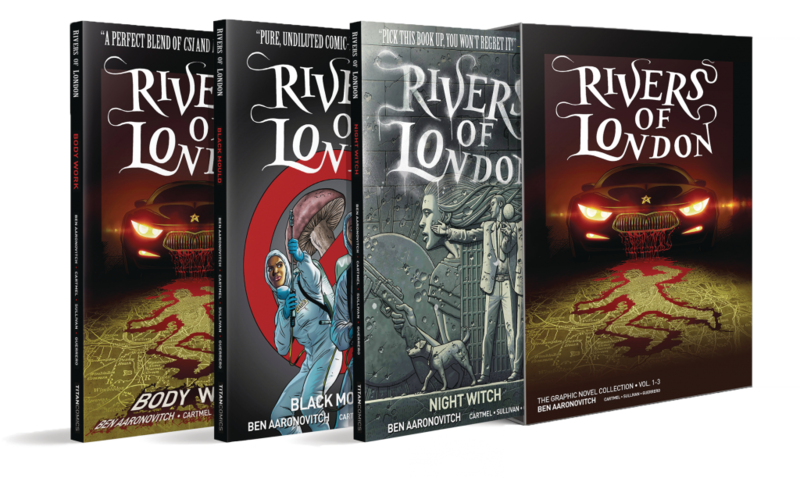 | Zeno Agency Ltd.
First four Rivers of London Comic Series Boxset out soon! Dive in at the beginning of the bestselling cops and wizards series from chart-topping author (and comics writer) Ben Aaronovitch, with this Box Set Edition of the first three graphic novels! A stunning box set edition of the bestselling first three graphic novels in the Rivers of London sequence, including a set of Rivers of London postcards! Starring Ben Aaronovitch’s laconic trainee wizard and budding detective, Peter Grant, these all-new adventures are essential parts of the smash-hit novel continuity! In the first volume, Body Work, Police Constable Peter Grant and his boss, Thomas Nightingale, tackle a car on a killing spree-without a driver. In Night Witch, Peter and Nightingale are caught up in a battle between Russian gunmen, a monstrous forest creature – and their nemesis: The Faceless Man. In the third volume, Black Mould, something dark and slimy is dripping through the walls of suburban London, so Peter is joined by a reluctant partner, Sahra Guleed! The fourth, fifth and sixth series are also available as collected editions: DETECTIVE STORIES, CRY FOX and WATER WEED. The next series, ACTION AT A DISTANCE begins soon! previous: Flannery’s BATTLE MAGE enters the fray in France!